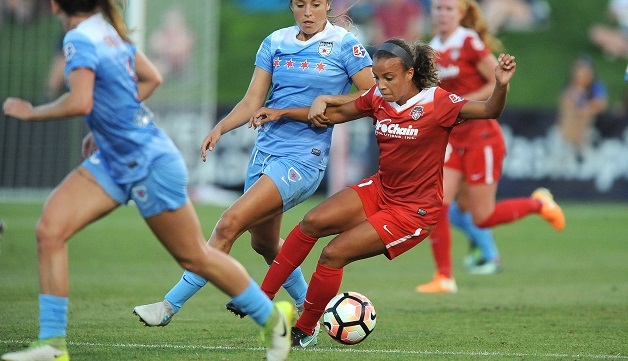 Boyds, MD (August 26, 2017) – Washington’s Cheyna Williams and Chicago’s Christen Press traded goals in the closing minutes of a 2-1 thriller at the Maryland SoccerPlex on Saturday night, as the visiting Red Stars came away with a narrow win to snap the Spirit’s four-game home unbeaten streak. Press netted the game-winner for the Red Stars in the 87th minute, slotting the ball into the center of the net from a tough angle along the left side of the box. Julie Ertz, Press’ U.S. international teammate, provided the assist on a long pass up the left side. Midfielder Kristie Mewis opened the scoring in the 23rd minute, finding the net her first game as a member of the Red Stars on a feed from Danielle Colaprico. Mewis’ shot struck the bottom right corner of the net on a left-footed shot taken from the left side of the box. Washington controlled the possession battle, holding the ball for 54.2 percent of the match. Spirit midfielder Tori Huster led all players for both teams with 52 total passes. Meggie Dougherty Howard was close behind with 47 total passes, 37 of which came on the attacking side of the field. The Red Stars outshot the Spirit 9-8 overall, with 4 shots on goal to Washington’s one. Defensively, Washington’s Estelle Johnson pushed her season interception total to 64, as she and Huster tied for the team lead with four each. Johnson entered the night ranked second in the NWSL with 60.